Ronda, NC—Experience ‘Chianti in the Carolinas’ as Raffaldini Vineyards celebrates Italian wine, heritage, and family at their 12th Annual Festa Italiana on Saturday, September 16th from 11:00 am – 5:00 pm. Feast on authentic Italian favorites from local food trucks such as pastas, paninis, brick oven pizzas, espresso, gelato, sausages, and more. Crowd favorites, Triple P, of Winston-Salem will excite with jazz improvisations while you shop for handmade goods and local ingredients from one of the many craft vendors. Fun for the entire family includes entertainers, face painting and crafts. You can even learn about your family history or brush up on your Italiano with the Triad Friends of Italy Chapter at the Italian Spoken Here tent. Pre-sale admission is available online and at the vineyard for $20.00 and will also be available day-of at the festival gate. 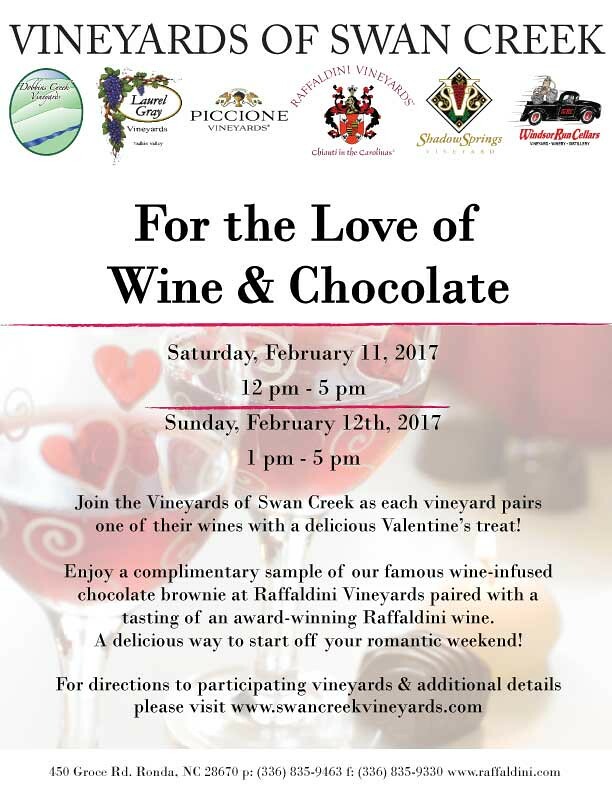 Tickets include parking, admission, a glass or three-wine flight of your favorite Raffaldini wines, and a souvenir Festa Italiana wine glass. Lawn chairs and blankets are permitted, however outside food, outside alcohol, and pets are not allowed into the festival. The Raffaldini family traces its origins to the 14th century in Mantua, Italy, where for generations the family produced wine on their family farm. Now named one of Wine Business Monthly’s ‘Top Ten Hot Small Brands in North America’, and one of Our State’s “Most Beautiful Places”, family-owned Raffaldini Vineyards brings Old World charm to the Old North State. Known as “Chianti in the Carolinas” Raffaldini currently produces North Carolina’s highest rated red wine, Montepulciano, and other varieties including Vermentino, Pinot Grigio and Sangiovese. 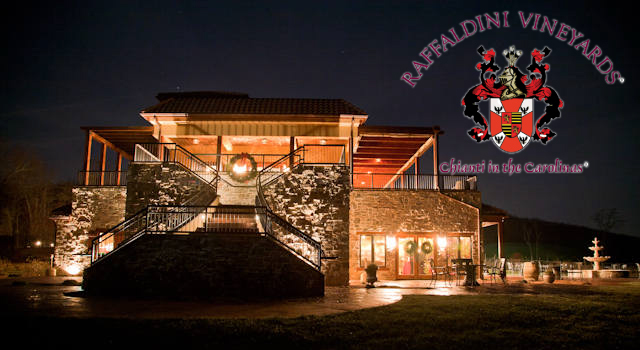 Raffaldini hosts public and private events throughout the year. Please visit our web site, www.raffaldini.com, call 336.835.9463 or email info@raffaldini.com for more information. Don't miss the first weekend of our newest wine club release. 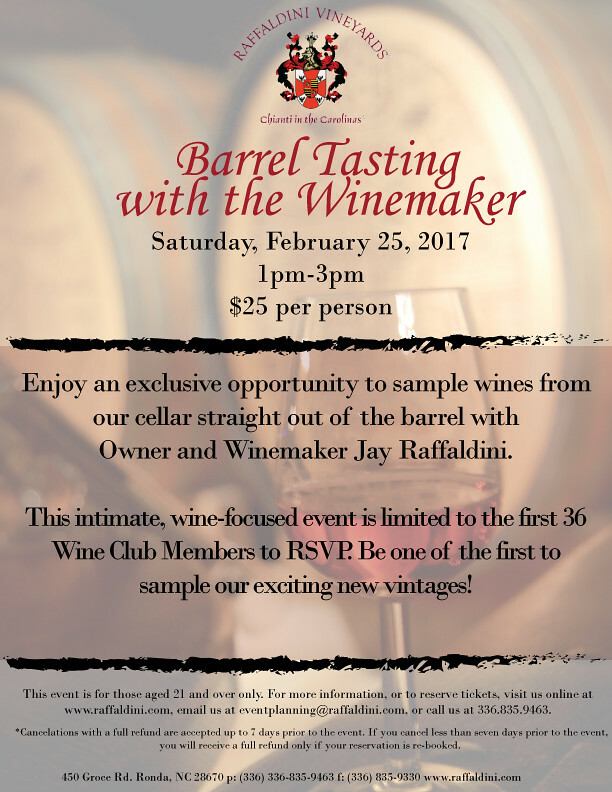 Owner and Winemaker Jay Raffaldini will host Saturday's festivities which feature an exclusive wine and food pairing on the 2nd floor of our Villa from 12pm-4pm for wine club members along with a conversation with our winemaking team on the new wines at 1pm & 3pm. The Fall 2017 package features three stunning new wines, the 2016 Girasole, 2015 Sangiovese Classico and 2015 Montepulciano Riserva. In 2015 we were blessed with pristine harvest conditions yielding the best red wines we have produced to date. These wines express unparalleled depth and complexity, revealing layer after layer of our estate's unique flavor profile. The 2016 Girasole arrives just in time for late-Summer enjoyment, beautifully crisp and a refreshing complement to our big reds. The cost for this exclusive, six bottle package with your 5% discount and sales tax is $158.57. The Fall Wine Club Package is now available for purchase on our web site. Click the link below to reserve your allocation today. Click to email our support staff or contact us by phone at 336.835.9463. 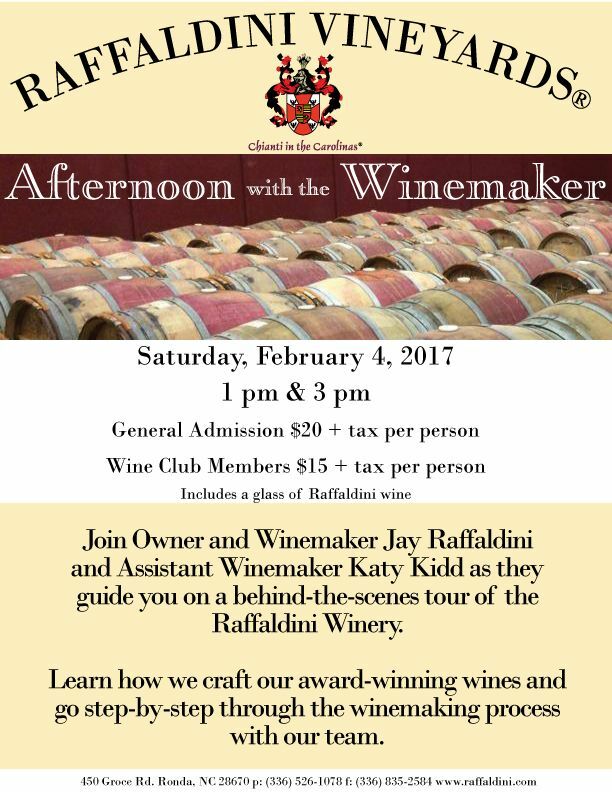 Be a part of the winemaking process at Raffaldini Vineyards. You will taste wines that are currently in production with our winemaking team and enjoy a traditional harvest wine dinner. Work side-by-side with owner and winemaker Jay Raffaldini and the rest of the team during this harvest immersion. 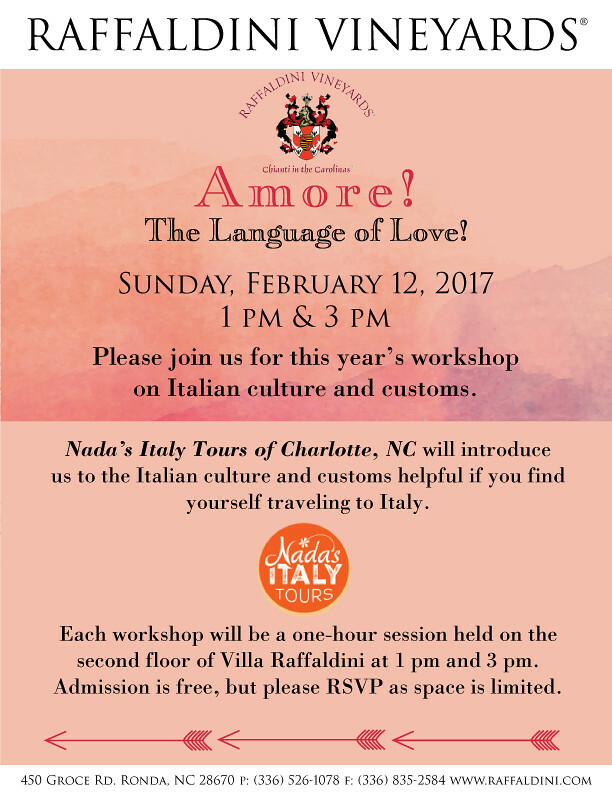 Join food vendors, entertainers, artists and friends from across the Southeast for a celebration of all things Italian! Savor a selection of authentic Italian cuisine while you shop our vendors for the perfect local, handmade gift. Relax to our selection of live entertainment from musicians and visual artists. Take advantage of a limited-time pre-sale discount of $5 off admission. Admission is $15 until August 16. After August 16 and day of admission is $20. Visit our web site for more info on the Festa and vendors. Access to Festa Italiana VIP Section in Villa Raffaldini. VIP Section includes indoor bathrooms, exclusive upstairs bar, VIP identity badge, and more. Click here for a full list of events. Other upcoming events include the following. 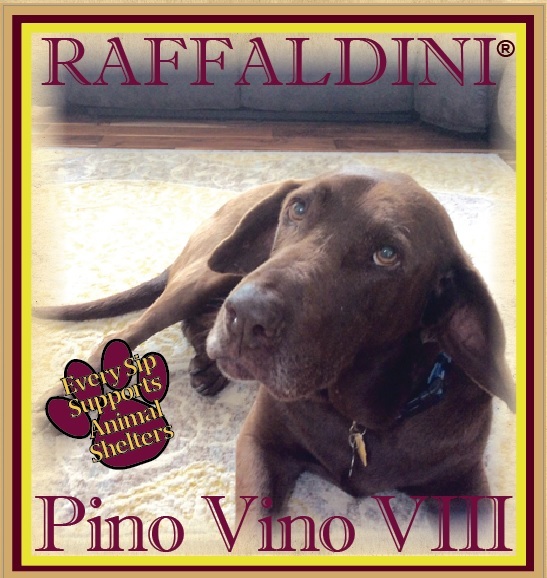 Pino Vino IX: Now Available! 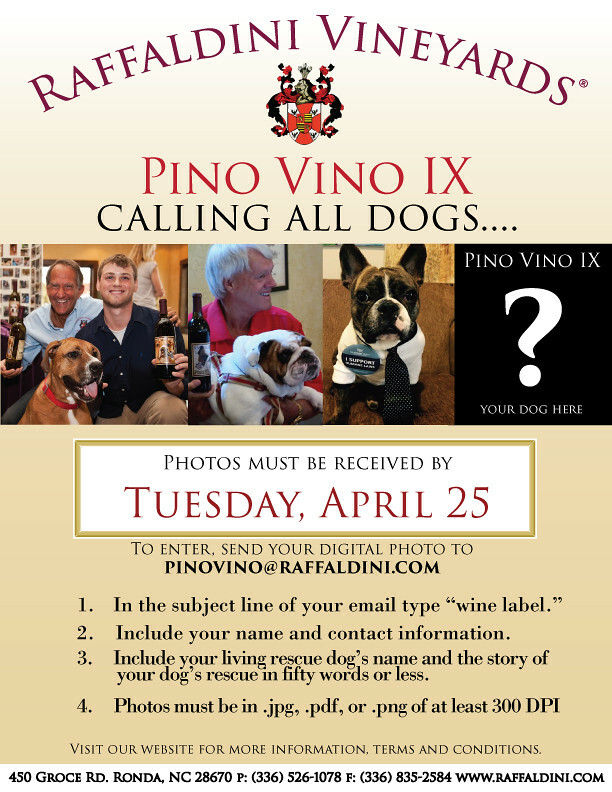 Thank you to everyone who stopped by last Saturday for our Pino Vino IX Rescue Dog Wine Label unveiling! We are excited to have Bentley as our ambassador for rescue animals everywhere. Pino Vino IX is now available in the tasting room and online. Every sip supports animal shelters! Thank you to Piedmont Triad residents and readers of the Winston-Salem Journal for voting Raffaldini Vineyards & Winery as the best winery in the Triad. 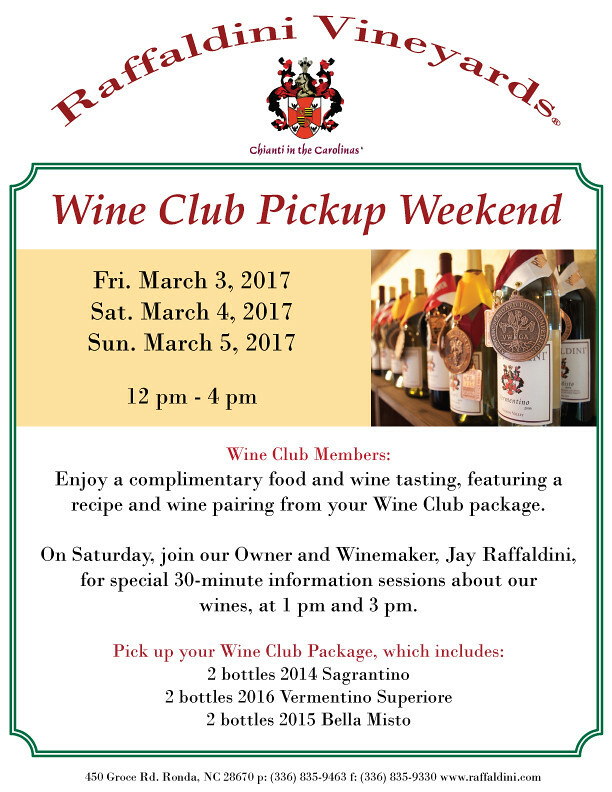 Please share the news with your friends and neighbors and share this email with a friend who has never been to Raffaldini before. Harvest is upon us and there is no better time of year to visit.